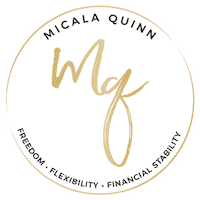 How I went from teacher to freelancer to online business owner helping thousands of moms around the world find work at home freedom, flexibility, and financial stability. Before I had this fancy website. Before I had a tiny, but mighty following. Before I was helping moms like you build profitable freelance businesses from home, I was a high school english teacher desperate to be a stay at home mom, but the reality of living on one income just wasn't in the cards. I was sick of feeling stressed, anxious, angry about rushing my daughter out of bed in the morning to drop her off at daycare, so I could get to work on time. Rushing out of work the second... (or maybe it was a few minutes before) my contract time was up just to rush home, sneak in a few minutes of playtime, before we had to eat dinner and then rush through bedtime routine because I had MORE work to do for my 9-5. I sat at my desk crying, hoping for something better. Hoping for this dream job that would allow me the freedom to snuggle extra long in the morning with my daughter, explore our city during the morning, and take her to the park in the afternoon. But it turns out this wasn’t just a dream. It became my reality. And it can be yours too. A freelancer is an independent contractor who offers services to businesses on a project basis or a monthly retainer. I technically got started as a freelancer in January of 2016. But the road to profitable was long. Mainly because I had no idea what I was doing, no idea how or where to look for clients, but the biggest reason my road to success was long and drawn out is that I let fear and the excuse game win for far too long. Once I slowly stopped making excuses and stopped letting my fear of failure prevent me from putting myself out there, I gained momentum. I landed my first client in August of 2016, 7 months after I got started looking. And once I got that client, 2 more quickly followed. At this time, I was still teaching. But I was determined to replace my income so I could stay at home with my daughter Mclaren and my son George who was due in April. Guess what… I did it. And I did it while working only about 15-20 hours a week and my take-home pay was triple what I made teaching after we cut the daycare expense out. In May of 2017, I said goodbye to teaching in a classroom forever and have not looked back. Shortly after I left teaching, I started to get asked all the time, how did you do it? Can I do it? Can you help me? At first, I helped everyone for free, but one day there were WAY too many moms asking me to help them and I just didn’t have the time to be able to help them all individually, so I started a facebook group to help them all at the same time. So I launched my first version of a program on how to build a profitable freelance business from home in September of 2017. One quit her job week 3 of the program. Others quickly started landing clients. And one of those original moms is on my team today! Over the last year and a half, I developed a reputation for being the go-to person for teaching moms step-by-step how to build a profitable freelancing business from scratch. And I’ve become known for the success the women in my program have. And guess what else… you my sweet friend can do this too. "within one month... I had made enough to not have to return to teaching after baby #2!" You have in you right now a service that business owners are looking for. And you don’t have to leave your house, put your kids in daycare, and sacrifice everything just to earn a paycheck. You can earn a full-time income from home on your terms. And you can do this all while creating a life you love. And if you are saying, hell yes! This is EXACTLY what I have been searching for too… then mama, your next step is to download any or all of my resources below. I am a wife, mom, work at home enthusiast who runs on giggles from my kiddos, kisses from my husband + lots of coffee and candy. I host the Live Free Podcast. You can find me in Kansas City (suburbs) and when I’m not working you can usually find me walking my kids to the park, shopping on the plaza, or sitting down with my family to enjoy a home-cooked meal. P.S. my favorite form of self-care is a nice glass of Malbec (by nice I mean a $5 bottle from trader joes) and a hot bubble bath. Let’s get to know each other better… here’s where I like to hang out.